Knowing how to skillfully use a knife is a very important part of grilling. Almost every recipe you use for grilling will include some type of knife work. Whether it’s simply removing the tips off of chicken wings or correctly slicing hasselback potatoes, you need to know how to do it safely and properly! Cutting boards today are made of different materials, including, wood, plastic, composite, and bamboo. I always keep a few boards in my kitchen for different tasks; a small one for mincing fresh herbs, a medium one for chopping vegetables, and a larger one for cutting fresh meat. Use the correct size for the job! Plastic boards are available in many shapes and sizes. They last a long time and are dishwasher safe. Avoid hard surface material like glass or granite. They are slippery and dull the knife quickly. If your board slides around on the counter top, it’s not safe and it needs to be stabilized. I like to moisten a kitchen towel, and place it under the board. 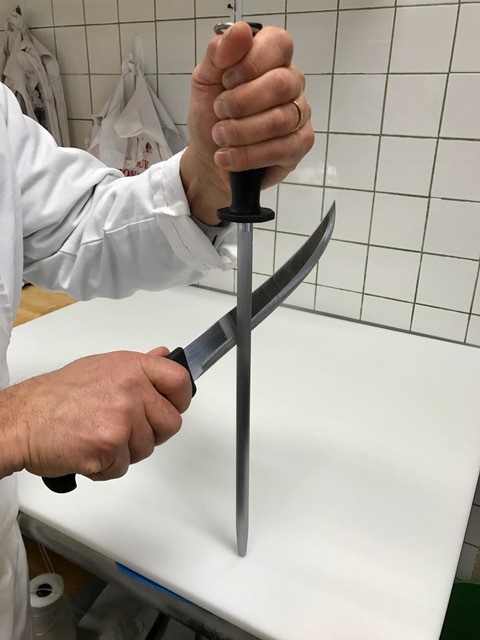 At my butcher shop, one of the most important tools is the knife. We have an array of knives, from cleavers, breaking knives, butcher knives, and boning knives. Each knife is designed to do a specific task. I keep 4 knives at home, ready to go at all times. 1) Chef’s knife, this is probably the most used in my block. 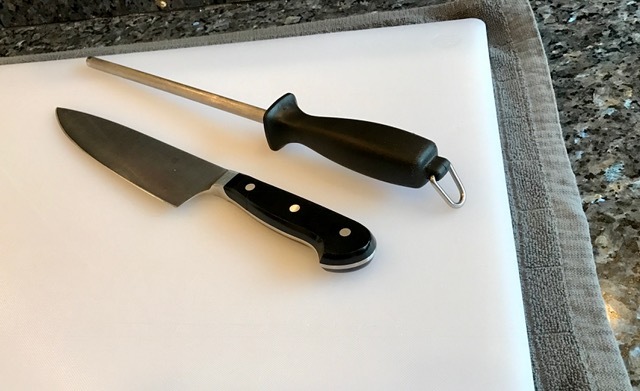 These knives are usually 8 to 10 inches long and can take care of most jobs requiring fruits, vegetables, and meats that you want to slice, dice, mince, or julienne. 2) Boning knife, it’s designed to do just that, cut around the bone, not through it. Boning knives are typically 5 to 6 inches long, and the blade can be semi-flexible or stiff. Semi-flexible blades allow you to keep the edge very close to the bone. Stiff blades are great for making that accurate cut, without any wiggle to the blade. 3) Serrated knives can be used for more than just slicing bread. I use one that is about 6 inches long for slicing anything which requires a little grip to cut through, like tomatoes, citrus, or melons. 4) Paring knife, think of it as a little chef’s knife. Best used for slicing, peeling, or chopping anything that requires detail, and that is too small for that big blade. A must-have in any kitchen. The honing steel realigns the fine edge of the blade, and should be used every time you use your knife (except serrated blades). To safely steel the knife, place it vertically on your cutting board gripping the handle on top. Start at the heel end of the blade and swipe it downward at a 20-degree angle using the entire length of the steel. Repeat on the other side. Four to 6 times per side should do the job. If you still can’t get a sharp edge on it, it’s time to have your knives sharpened. I recommend bringing them to a professional knife company to have them sharpened once a year. A dull knife is a dangerous knife! Most accidents are usually due to the knife not being sharp. 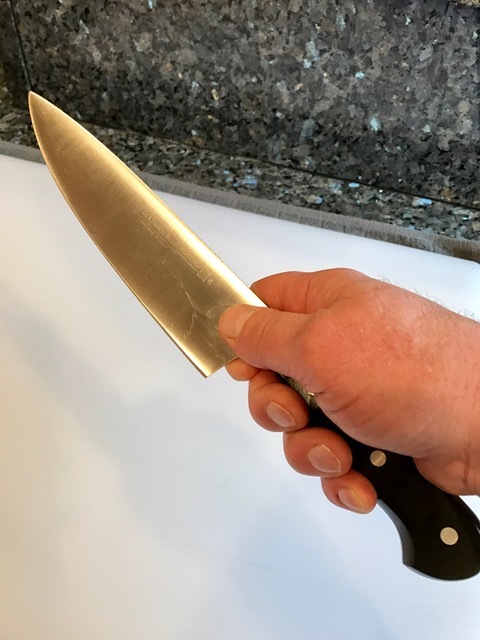 A dull knife will make you apply more pressure to the item you are cutting. This can result in injury as the knife may roll off the item cutting you. A sharp knife will cut be faster, safer and easier. It won’t seem like a chore. 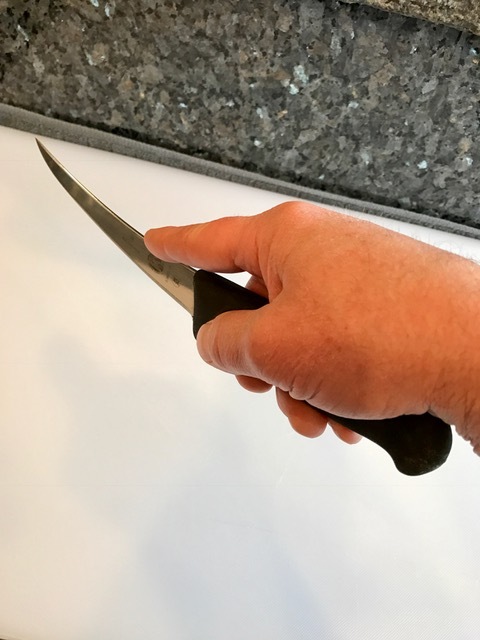 Proper griping is important to achieve better control and balance of the knife. When using my chef’s knife, I like to use the pinch or blade grip. The pinch grip entails wrapping 3 fingers around the handle, then pinch the blade with your thumb and index finger. Gripping a boning knife is different. I like to grip the handle with 3 fingers and thumb, and then place my index finger on top of the blade. This method is used when cutting with the tip of the blade, like boning out a chicken breast. Never put a knife in a sink filled with soapy water. You can’t see it when reaching in the water. Wash your knives by hand. This will help keep your knife sharp and looking good for years. Store your knives safely. Return your knives back to the block; don’t just put them in a drawer, which can be dangerous when reaching in. This will help keep them sharp, and you’ll always know where they are. Use the knife for what it was designed for…not as a pry bar, hammer, screwdriver, can opener, box cutter, or anything else. 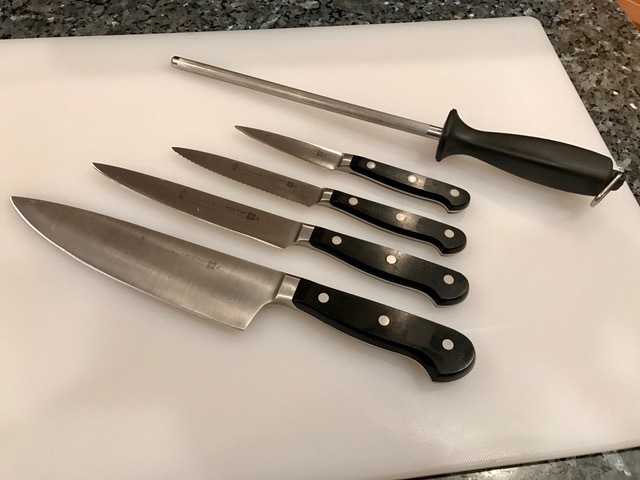 Your knives are an investment; so take good care of them! !